BEIJING, China (CNN) -- In one big jolt, the worst earthquake to hit China in 32 years changed the lives of millions of people in the nation's heartland. 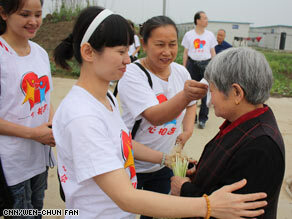 Volunteers comfort residents of Anxian temporary housing camp, most of them from Beichuan County. The earthquake struck Sichuan province on May 12, 2008, at 2:28 p.m., just when students were taking lessons in schools, caretakers were watching over giant pandas, farmers were tilling fields and people were shopping in stores. The initial tremor, which had an 8.0 magnitude, was so strong it was felt as far away as Beijing and even Bangkok, more than 2,000 kilometers (nearly 1250 miles) away. The epicenter: Wenchuan County, a lush, mountainous region with a population of more than 111,000 people. It is also the natural habitat of the giant pandas. The quake flattened Wenchuan and many surrounding towns and cities. Millions of people lost their loved ones, their homes and belongings. It rendered roads and bridges impassable, damaged dams and riverbanks, and created "quake lakes" that cut off desperate survivors and posed risks of flash flooding. One year after the quake struck, China is still counting the toll. The temblor killed 68,712 people, state-run Xinhua news agency quoted Huang Mingquan, head of Sichuan's provincial civil affairs department, as saying at a press conference last week. It left 17,921 missing, more than 374,000 injured and at least 15 million people displaced. Thousands of schools collapsed in the earthquake, trapping students under the debris. Among the victims, 5,335 students died or are missing, said Tu Wentao, head of Sichuan's education department, according to Xinhua. More than 500 were permanently disabled. The disaster served as a rallying point for the Chinese government to reach out to the outside world and to instill patriotism and humanitarianism among the Chinese. In a newfound transparency and public awareness, local media ran 24-hour coverage of the quake rescue efforts, and foreign media were given open access to the quake-affected areas. However, since then, the government has come under some criticism for its handling of the post-quake period -- notably the quality of school construction in the affected area and the number of children who perished in the temblor. Until a few days ago, there was no official tally of the number of children who died. Some parents pointed to poor design and use of substandard building materials as some of the reasons why many schools - described as "beancurd dregs buildings" - collapsed in areas where other buildings were not badly affected. When they called for an official death toll of students, they encountered official resistance. The parents have supporters, such as Beijing-based artist Ai Weiwei, who organized a team of volunteers to investigate, record and account for what happened. "Once you have the basic facts, you know who is responsible for those kids," Ai told CNN. "Thousands of people died in this earthquake and is it necessary for them to die, or is it caused by some mistakes or wrongdoings in the construction of buildings?" Volunteers have also been harassed, accused of prying into "state secrets," prompting protests from human rights activists in and outside of China. In an open letter released last Thursday and addressed to Chinese leaders, a group of more than 140 Chinese writers, intellectuals and human rights activists welcomed the tally of student deaths but said it was not enough. "We wish the authorities will do more, not just to investigate the identities of the student-victims but also to find out the factors that caused this massive deaths and injuries, which could have been avoided, in order to prevent similar occurrences. Same time, we ask that you stop the persecution of citizens who are investigating the incident and that you allow citizens to participate in the investigation of the deaths and in post-quake reconstruction." Media coverage has been affected, too. The Foreign Correspondents' Club of China said it had "received several reports of journalists being harassed and detained in Sichuan province" in the lead up to the anniversary. "Reporting restrictions are a barrier to understanding the circumstances and needs of the people trying to recover from last year's disaster. They should be lifted," said the group's president, Jonathan Watts, in a statement issued in April. Authorities have built 1 million houses in rural areas and 33,000 apartments in the cities, said Yu Wei, spokesman of Sichuan provincial government, last Thursday at a press conference, according to state media. Hundreds of thousands of more housing units were also under construction, and the government has helped nearly 1.3 million quake victims find new jobs, Yu said. "Quick response from the Chinese government, support from other countries and participation from the Chinese people -- they all helped greatly with the disaster relief efforts," said Jiang Li, vice minister of civil affairs. Still, some survivors continue to live in temporary housing, though it is not clear how many since the Chinese government has not released official figures. Xi Chengyong, a shoemaker from the leveled county of Beichuan living in a prefabricated housing camp, said quake survivors were struggling. "Let's talk about the fact ordinary people don't have any money ... the government hasn't given us anything -- 10 yuan (US$1.50) a day for the first three months, then 200 yuan (US$29.30) a month . . from three months ago they gave us nothing. The government is not giving us anything to live on," Xi said. "It's tough now. If you go out looking for work, we can't find any jobs. We have to rely on almost nothing, barely enough to buy gruel," he said, as a group of men around him nodded in agreement. "We just hope the government will help us common people." The quake unleashed consequences that continue to reverberate today. Twelve of Sichuan's more than 600 officially recognized quake orphans have been legally adopted, while the rest are still in "welfare homes." Some survivors have been so distraught over their losses that they have taken their own lives. Last month, Feng Xiang, 33, a public affairs official of Beichuan, which was located next to the quake epicenter, was found dead - the third local official known to have committed suicide in the devastated area. Feng, who lost his 8-year-old son in the quake, posted an essay, "Many Ifs," on his blog an hour before his suicide, bidding goodbye to his family, friends and netizens. He wrote: If I die one day, my brother, please shoulder the responsibility to take care of our parents.... If I die one day, my wife, please do not grieve." It is difficult to measure how long it will take people living in the quake zone to recover. Artist Ai said he hopes that everyone -- in and out of China -- will take away a few lessons from the tragedy. "I think to respect life, which is quite rare in this culture today, to pay more attention to the value of human life, human rights and to fight for the basic dignity of life."